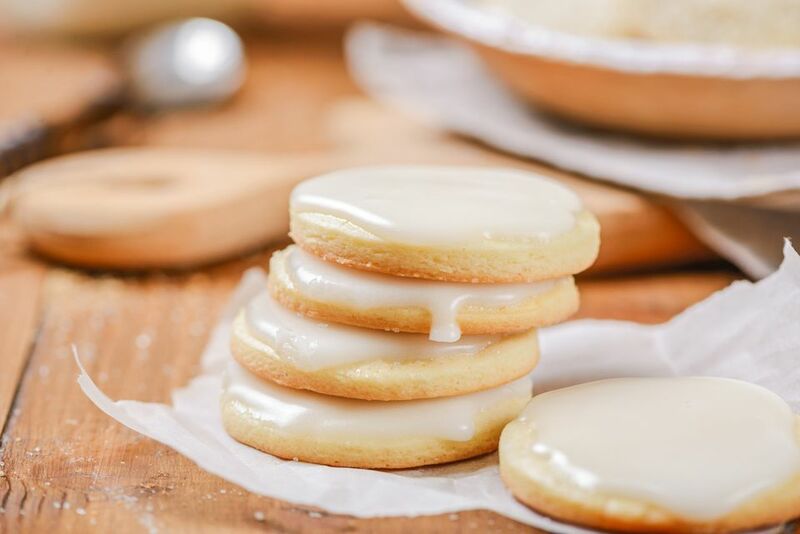 These sugar cookies are light and delicate and they're perfect for decorating with royal icing. For this recipe, you'll roll out the dough and cut out the cookies with any shaped cutter you wish. The trick to baking tender butter cookies is not working the dough too much. The more times you roll out the dough, the harder the cookies will turn out. This is because working the dough develops the gluten in the flour and makes them tougher. When you're cutting out cookies, you're going to end up with a certain amount of scraps. You can collect these scraps and re-roll them, but those cookies will be tougher. Finally, using cake flour will create more delicate cookies, but you can substitute pastry flour or all-purpose flour. Whatever you choose, just make sure you use 400 grams. Gather ingredients and allow all to come to room temperature before beginning. Using the paddle attachment of a stand mixer, cream together butter, sugar, and salt on low speed. Add the egg, milk, and vanilla and mix until blended. Add the dry ingredients to wet ingredients and mix only until they're combined. Turn the dough onto a work surface. Using the heel of your hand, gently flatten the dough into a thick round, taking care not to overwork it. Wrap it in plastic and chill in the refrigerator for at least 30 minutes. Unwrap the chilled dough, transfer it to a lightly floured (or powdered-sugared) workbench or butcher block, and use a rolling pin to roll the dough out to about 1/8-inch thick. Cut out the cookies and place them on an ungreased baking sheet. Remember to cut them as close together as you can so you don't waste any dough. Using a pastry brush, wash the tops of the cookies with milk and sprinkle on some sugar, unless you'll be icing the cookies. Bake 8 to 10 minutes or until the edges and bottoms of the cookies are barely beginning to turn golden brown. If you're icing your cookies, ice them now and enjoy! Instead of sprinkling with plain sugar, use colored sugar crystals. You could also dust them with powdered sugar after baking. For colored sugar cookies, add food coloring to the dough at the same time you add the flour. Chill the dough thoroughly to make it less sticky, and while it's fine to dust your work surface with flour for rolling, don't use any more flour than you need to. Too much flour will also make the cookies come out too hard. Only use enough so that the dough doesn't stick. Or use this ingenious trick: Dust your surface with powdered sugar instead of flour. For a tangier cookie, substitute 1 1/2 teaspoon lemon extract for the vanilla. Use almond extract instead of vanilla for a nuttier flavor.